Sometimes it was actual people, not sophisticated mannequins, who were the simulation subjects. In one section of the convention hall’s display floor, a young woman reclined as a technician passed an ultrasound wand over metal targets stuck all over her body. As the wand glided over her abdomen, the ultrasound showed twins. As it passed over her chest, the machine displayed pericardial effusion — potentially deadly fluid build-up around her heart. Thin and young, the model was clearly neither pregnant nor suffering advanced heart disease. But those little targets on her skin told the ultrasound to make it look like she was, at least on the simulation screen anyway. The technology is being incorporated into mannequins made by Laerdal Medical that are commonly used to hone doctors’ diagnosis skills, said Dr. Eric Savitsky, founder of SonoSim, manufacturer of the device. Because ultrasound machines are filled with mechanical structures, they have long been a destination beyond the reach of even the best medical simulators. But the SonoSim targets get around that problem by mapping specific body surface locations to pre-recorded ultrasound images. This allows for more in-depth ultrasound training than has ever been possible, Savitsky said. 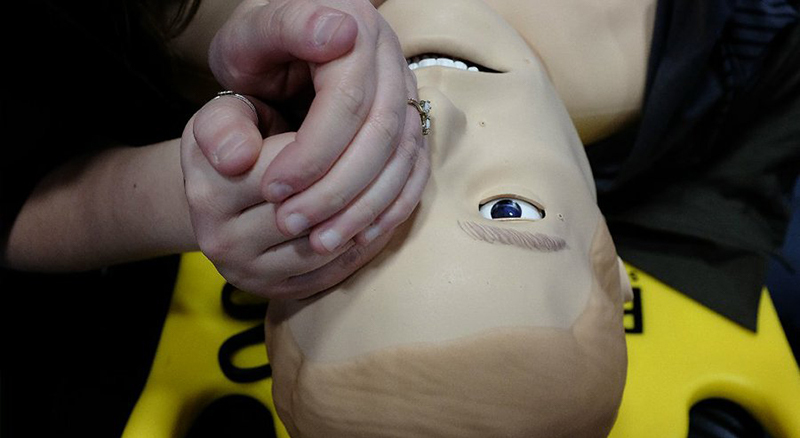 It also can enable more sophisticated simulations where the mannequin is programmed to exhibit subtle symptoms that could lead to a broad range of other diagnoses. “A lot of conditions that doctors have to diagnose the symptoms are what we call protean, which means that the way symptoms present themselves are very vague and could mean several different things. Now we can have simulations where the doctor can choose to move to ultrasound in these situations, and when they do, they have an opportunity to clarify their diagnosis by looking inside the body,” Savitsky said. As he made his pitch, others in booth after booth at the convention center were doing likewise. With so many products and with health care costs continually on the rise, it is more important than ever that medical schools, hospitals and first responders invest in technologies that truly deliver a discernible benefit over less sophisticated but cheaper alternatives.